AsianScientist (Jul. 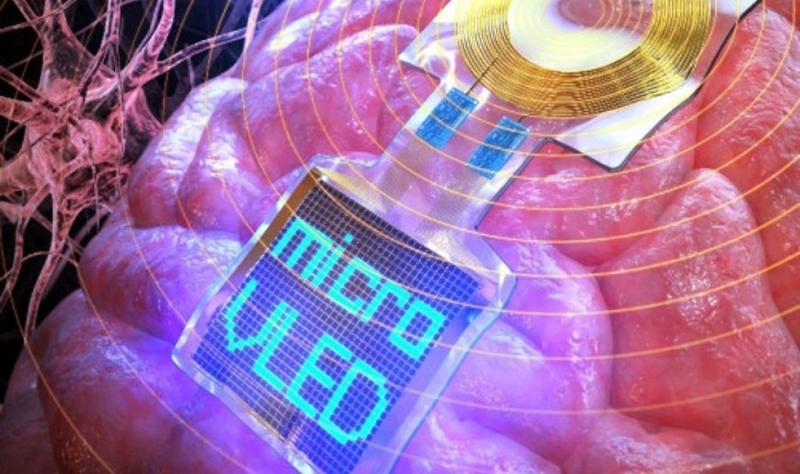 5, 2018) – A research team at the Korea Advanced Institute of Science and Technology (KAIST), South Korea, has developed flexible vertical micro-LEDs (f-VLEDs) that can be used on mouse brains. They published their findings in Advanced Materials. Micro-LEDs are a sub-100 µm light source for red, green and blue light. They are being investigated as brain implants for optogenetics because of their outstanding optical output, ultra-low power consumption, fast response speed and excellent flexibility. However, manufacturing micro-LED displays relies on individual chip transfer of millions of LED pixels, which significantly raises production cost. In the present study, researchers led by Professor Lee Keon Jae from KAIST devised an efficient and inexpensive method to produce thin-film blue f-VLEDs. Building on their earlier research, the team managed to perform a one-time transfer of thousands of thin-film blue vertical micro-LEDs (thickness < 2 μm) onto plastic, greatly accelerating the fabrication process and reducing its cost. The blue f-VLEDs achieved an optical power density of ~30 mW/mm2, three times higher than that of lateral micro-LEDs. Because heat generation by the micro-LEDs was reduced, a device lifetime of 100,000 hours was achieved. In addition to optogenetics studies in mouse brains, these blue f-VLEDs can be attached to curved surfaces such as wearable devices and stably operated by wirelessly-transferred electrical energy. “[Using our technology], we plan to develop a full-color micro-LED display in smart watch sizes by the end of this year,” said Lee.